If there was one track that we think an adventure seeking 4WDer should add to their touring bucket list, the Binns Track would be high up on that list. And for very good reason! This track which begins in the Northern Territory’s East MacDonnell Ranges, is nearly 2,200km in length, and travels north through some simply stunning countryside before ending in western Queensland at the Barkly Highway. 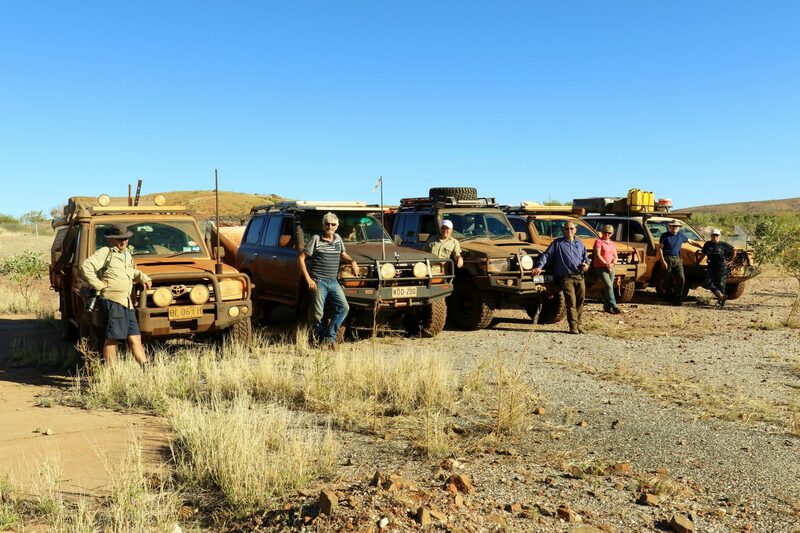 So after meeting up with the rest of our travelling party at the historical town of Arltunga in the East MacDonnell Ranges, we were all very eager to get going on the Binns. But with dark clouds looming overhead, there was definitely trepidation as to whether track conditions would remain dry. You guessed it, later that night the heavens opened! If our campsite was anything to go by in the morning, we knew the tracks would be wet. So we decided to stay put to let the tracks dry out a bit which turned out to be the right decision. By the time we eventually took off later in the day, we were thankful the rain had been localised and track conditions improved fairly quickly. But the rain didn’t stay away for long, as we watched magnificent lightning shows almost on all sides of us on two occasions, knowing it was only a matter of time before it reached us. With a couple of heavy downpours, sections of the track ended up being quite wet making travelling slow going. There is no doubt cleaning the mud off the vehicle and camper is going to take considerable time when we get home, but we laughed when we saw our tyres pretty well were self-cleaning. We were impressed! One section of the Binns track passes through some sensational scenery called the Pinnacles. The contrasting colours of the hills with the luscious green vegetation was super spectacular, especially when approaching the magnificent Harts Range. The range was a beautiful sight and one which was difficult to capture in a photograph. Not far from Harts Range is Boxhole Meteorite Crater which is only a short distance northwest of Dneiper. It’s not a grand crater like the one at Wolfe Creek in WA’s Kimberley region, but it’s only a short distance off the track and worth looking at. Travelling with a drone this trip, we took the time to put it up to see the crater from the air – it gives everything a completely different perspective when you have a bird’s eye view! After reaching the Sandover Highway, we only needed to travel a short distance east before taking the turn off towards the Davenport Ranges to continue on the Binns Track. 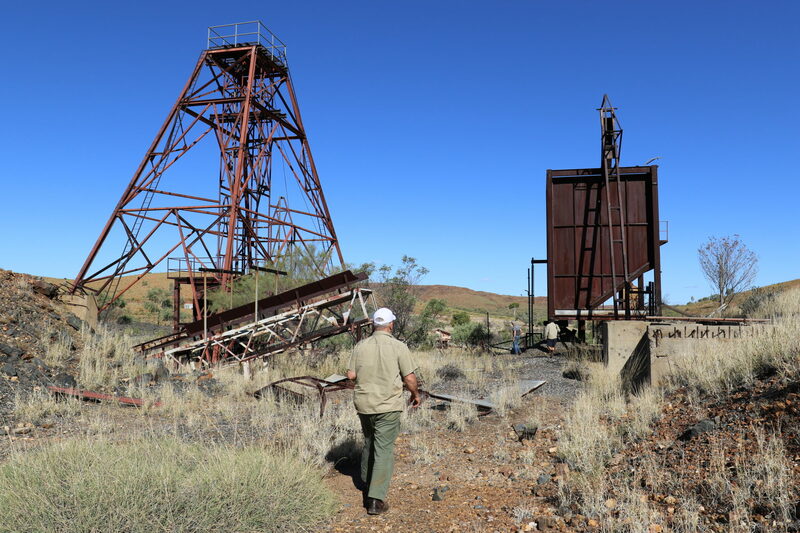 Arriving at the Hatches Creek wolfram mine ruins, we spent a couple of hours to look around the ruins which revealed all sorts of relics from around 100 years ago. Just watch where you step! Located close by to the ruins was Hatches Creek itself, a magnificent place to stop for a night or two. With recent rains, the water levels were up, drawing birdlife in from everywhere. 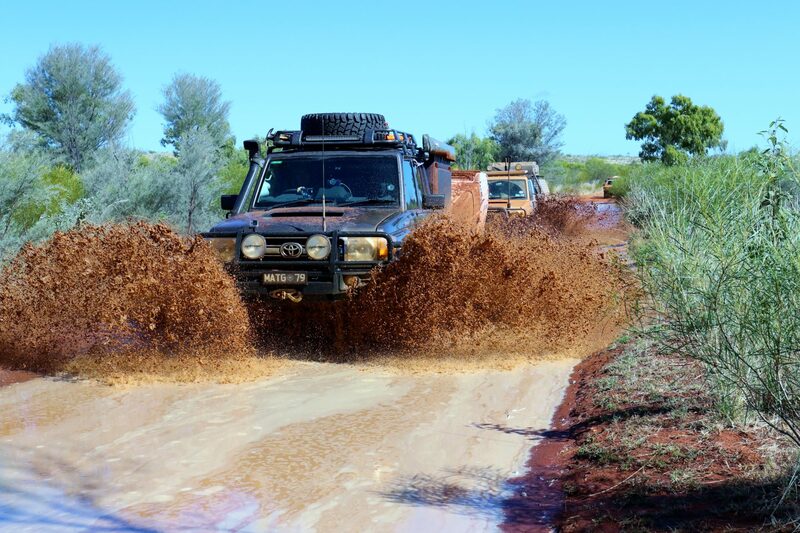 This meant we had multiple water crossings as we continued along the track, with the deepest crossing around 700mm. 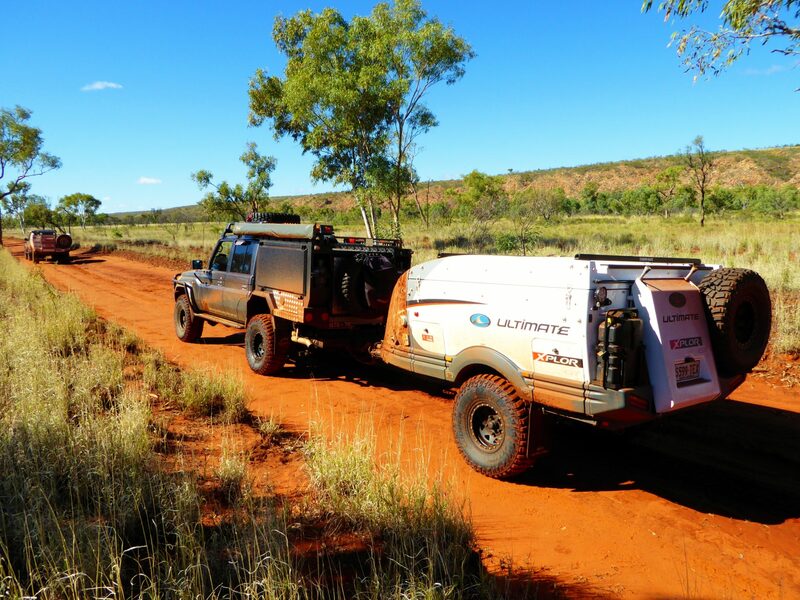 Finding campsites along the Binns Track wasn’t difficult – in fact, if nothing else, you could count on gravel pits for good flat ground which made levelling the camper a breeze. And we were able to have some cracking campfires for those cold winter nights with the excess of gidgee wood that was available along the track. 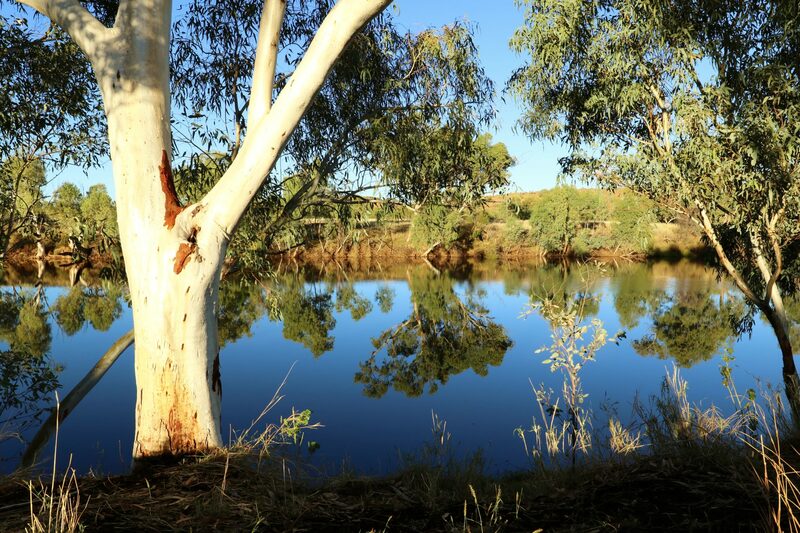 One major attraction along the Binns Track is Old Policeman Waterhole. Choosing to take the more challenging Frew Track to reach the waterhole, the 14 kilometres of slow and rough track had us climbing and weaving up and down over hills before arriving at what can only be described as an oasis. The waterhole was much bigger than we’d expected as it was easily around 50 metres across and several hundred metres in length. Birdlife here was magnificent, but the water also brought many other animals. There seemed to be a competition between the howling dingoes and the braying donkeys as to who could sing the loudest! It all provided great entertainment for us and is one of those experiences you just don’t forget. Further along the Binns, we timed our visit to Epenarra right on lunch time, so it was a perfect opportunity to pick up some hot food for our group. The store here is well stocked should you need supplies, and it’s the place to seek permission if you’d like to continue on the private track which meets up with the Barkly Highway. When we passed through, it was clear this track hadn’t been used for a while! Ruts and washouts were numerous, and with recent rains, there was wet patches galore, the track was slippery, but it all made interesting travelling when towing campers. We finally reached the busy Barkly Highway which sees the end of the Binns Track. While the track in dry conditions is a drawcard enough, the recent rains brought the entire region to life, and took this track to another level. So if you’re looking for a track which has some adventure without being over the top, why not add the Binns Track to your touring list…it’s a lot of fun!